Click the image below to see a custom interactive Google map of the area around Sonar with some places of note like where to eat or buy cigarettes within walking distance. Click on the points or lines and more info will pop up. You’ll have to zoom in a bit since Google sets that. You can order your tickets online (here) if you haven’t bought them already. They will be will call only at this point, which means they’ll hold them at the door for you. Thursday is sold out so you can’t get tickets for that day nor four day passes any more. If you really want to go Thursday you can try looking at the MDF Facebook event page (here) for people selling extra tickets or the MDF Message Board’s thread for buying/selling tickets here, and maybe you’ll get lucky. You could also try getting cheaper tickets for other days there from people desperate to sell. 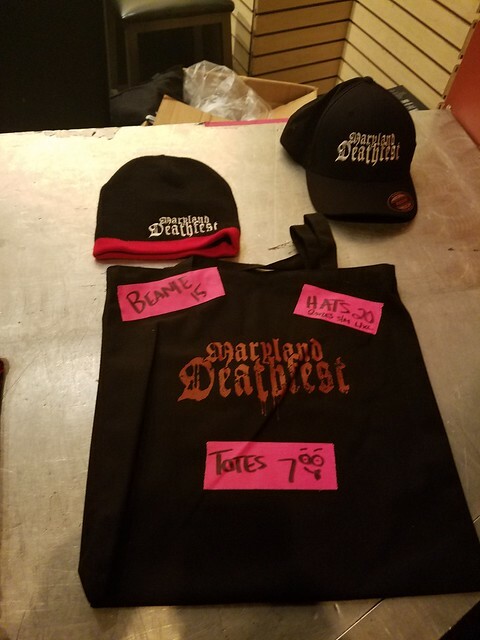 You can order merch for pick up at the fest here. You don’t have to order merch online but if you do you can guarantee they will have your size in stock when you pick it up at the fest. 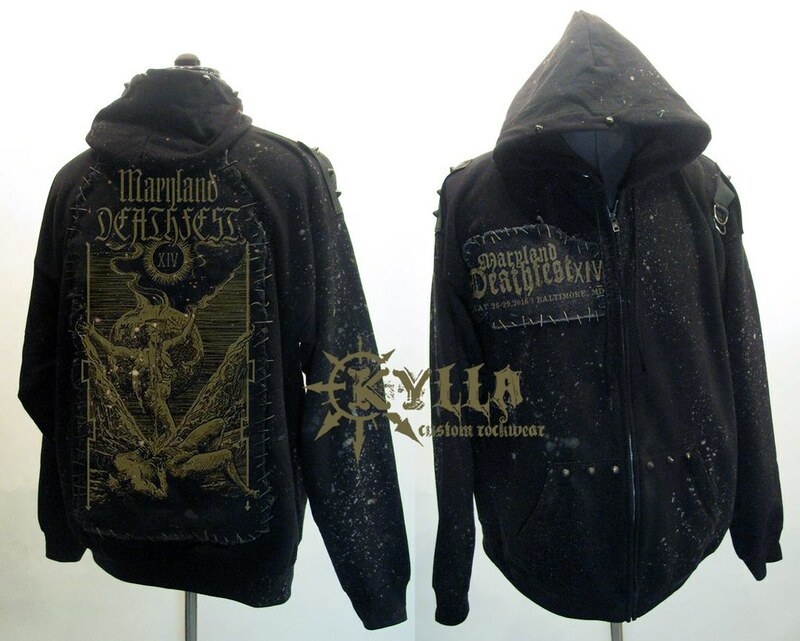 They have decent prices, their shirts are $13 and the zip-up hoodies are $27. This year they also have a poster for sale for $12. 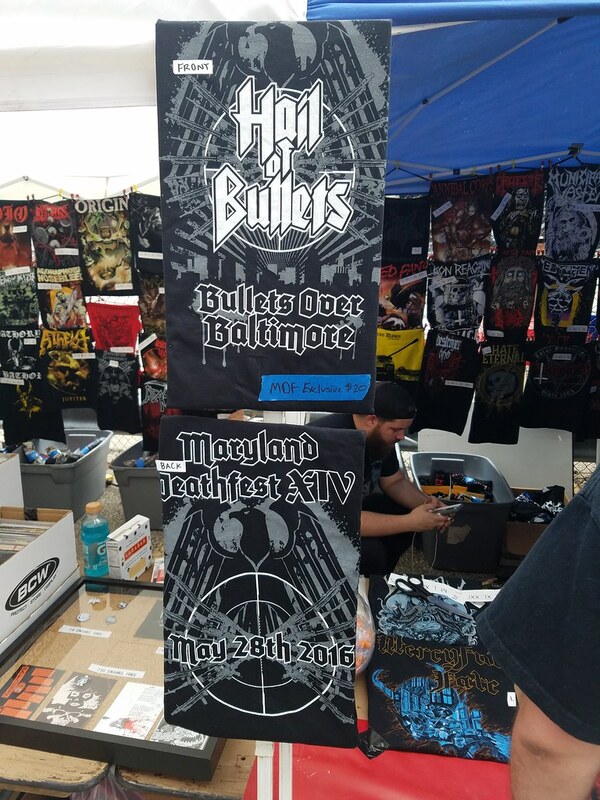 There is another poster for sale (see image on left) by Warlord Clothing, who has made posters for the fest the past two years as well. It is also $12 and is limited to just 150, you can preorder that here. If you are flying into BWI airport for Deathfest, the city has set a flat rate for a taxi to or from Baltimore at $30. From the airport you can also order a Super Shuttle ride for around $12 – $15 per person each way here. Alternately, you can ride the Baltimore Light Rail system to or from BWI to several downtown stops for $1.60 one way. Most downtown hotels will be near the Convention Center through Centre Street stops (two maps, one here and another here). 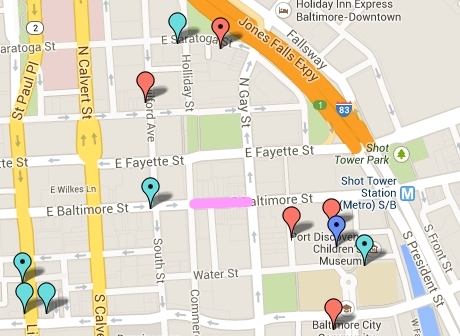 More info on Baltimore’s mass transit systems can be found here. You might want to bring some sunscreen with you if you are going to be at the fest for Friday, Saturday or Sunday as you’ll probably be spending a large portion of the day outdoors. Bring shoes you like wearing because you will probably be on your feet a lot while you’re there. You may want to bring a cheap plastic pull over parka in case it rains, especially if you’re packing a lot of electronics. You can bring a backpack or other bag in if you’d like to use it to hold merch you buy there, just know that they will search it when you enter. They do allow you to bring in cameras, including “pro” SLR cameras with detachable lenses however they will not be issuing photo passes to anyone. They do allow you to shoot video on your pocket cameras and phones but not on pro video cameras. Crowd surfing and moshing is allowed so be aware of what is going on around you, particularly if you’re bringing expensive equipment, and especially if you are up close towards the center of the stage. I recommend bringing some extra cash as there will be all kinds of vendors selling CDs, vinyl, cassettes, demos, t-shirts and other merch, and even some MDF exclusives (I’ll update the end of this post with photos and prices of the exclusives once the fest starts). 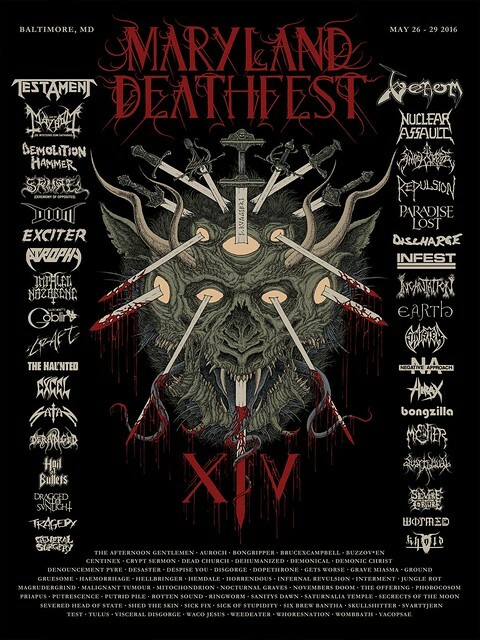 There is an ATM inside the Deathfest area but it will of course have service fees. 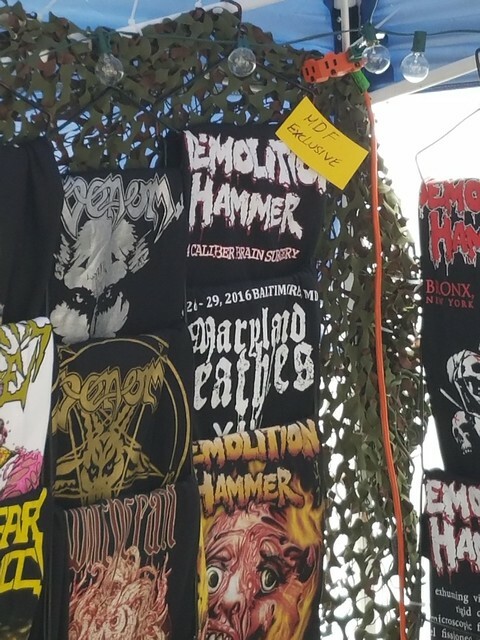 When you get to Maryland Deathfest you’ll see that they’ve blocked off the street in front of Sonar. They’ll build the stages there Thursday night so if you want to park in the parking lot in front of the venue, you’ll have to enter from the other entrance on the back of the lot. You can see where that is on the map I made (here). The lot across from Sonar was free in previous years but now the City Of Baltimore has decided to meter the lot. 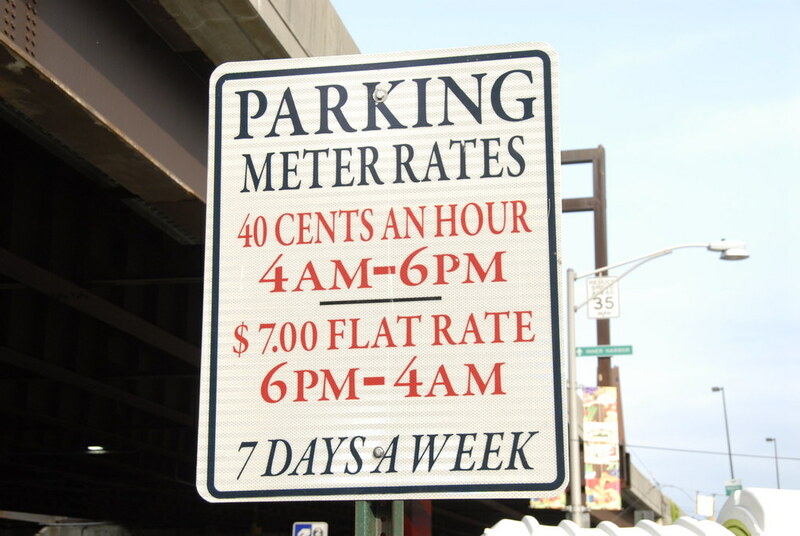 I shot a photo of a sign in the lot with the rates that you can see here. It’s 40¢ an hour from 4am to 6pm. Any amount of time from 6pm to 4am is a flat rate of $7. Yes if you do the math that means they jack up the rates at night specifically to screw over people going to Sonar, but that’s the city’s doing not the guys who run MDF or the venue. 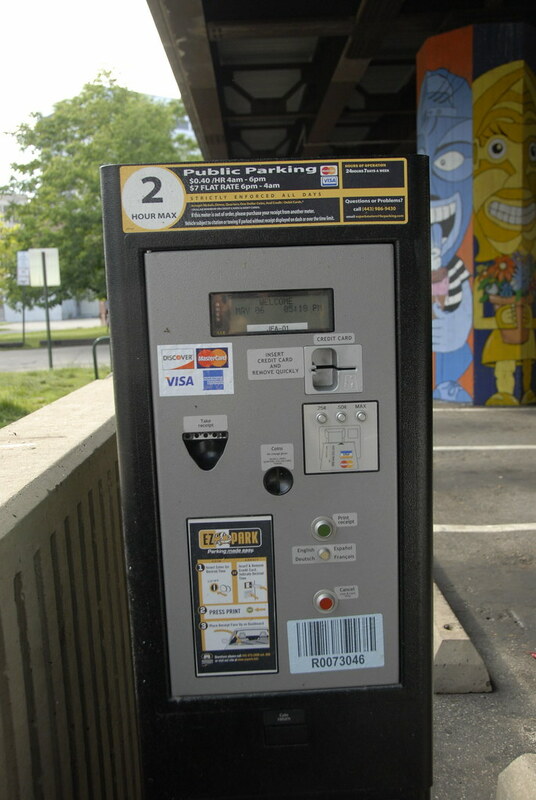 At least you don’t have to bring quarters, the meters accept debit and credit cards as you can see in this photo of one here. It will print a receipt that you will need to leave on your dashboard. I got a parking ticket there when it first switched over because I didn’t realize it had become a pay lot and the ticket was for $32. There will probably be a long line to get in during peak hours and if there is a band you definitely want to see I’d plan on getting there at least 45 minutes before they go on to make sure you get into the fest on time. You may end up getting in early but then you can always check out a band or two if you do, or scope some of the wares of the vendors. There’s often a bunch of junkies that hang out around the festival and I recommend you avoid them. Sometimes they find ways into the fest and try to pull admission bracelets off of people in crowds like when everyone has their hands up supporting a crowd surfer. They take these and give them to friends of theirs so they can get in as well and who knows what they’re doing, maybe picking pockets or something. They may seem nice and friendly but you really shouldn’t trust homeless drug addicts, call it common sense. Your ticket will get you a wrist band, and depending on how many days it is valid for will determine its color. Once you have your wrist band you can leave and re-enter at will and skip the line as well. 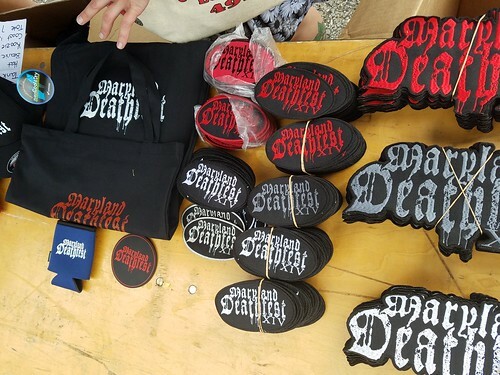 Deathfest is all ages but you will also get a drinking age wrist band if you’re over 21 and show them your ID. Note that by law all bars in Baltimore stop serving at 2am, which is about when the Fest will probably end each night. 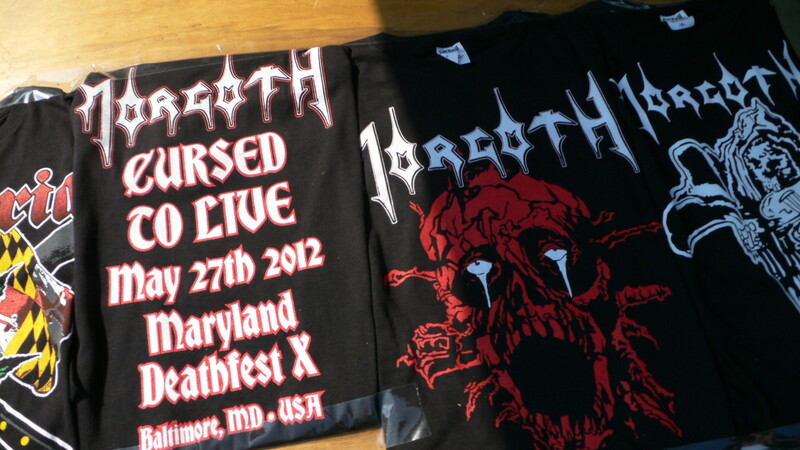 Maryland Deathfest X starts on Thursday, May 24th and the doors open that day at 4pm. This day has a bit of downtime between bands because it is the only day that is indoors only, and they only use one stage (the main stage). Thursday is completely sold out and MDF has stated (here) that there is no such thing as a downloadable or electronic ticket, despite their appearance on sites like StubHub. Don’t be lured into buying such a ticket as it is certainly a scam. They probably won’t have most of the vendors set up until Friday so if you ordered merch to pick up at the event, you’ll probably need to get it later in the weekend. All weekend long you’ll be able to pick up, for free, a program for this year’s Maryland Deathfest provided by Invisible Oranges. I’ve been lucky enough to get a peek at its contents and it looks pretty cool. 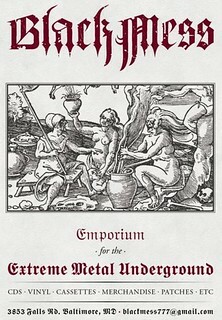 It has a short bio on bands playing and some bands, such as Electric Wizard, Tsjuder, Brujeria and Mortuary Drape, will have expanded features on them with lots of quotes from the members of the bands. Check out the cover art on the left and keep an eye out for it. Friday, Saturday and Sunday there will be three stages going most of the day, so be sure to check out my quick schedules for each day that show which bands start on which stage in chronological order (linked at the top of this post). Because of the multiple stage set up, usually when a band finishes their set on one outdoor stage the band on the other outdoor stage will start immediately. This means if you really want to see a band up close you will have to camp out there a bit as they set up while most other people are watching bands on the other stages. Due to noise curfews, the outdoor stages have to be done each night by 11pm, however the indoor stage will continue to have bands well past midnight. 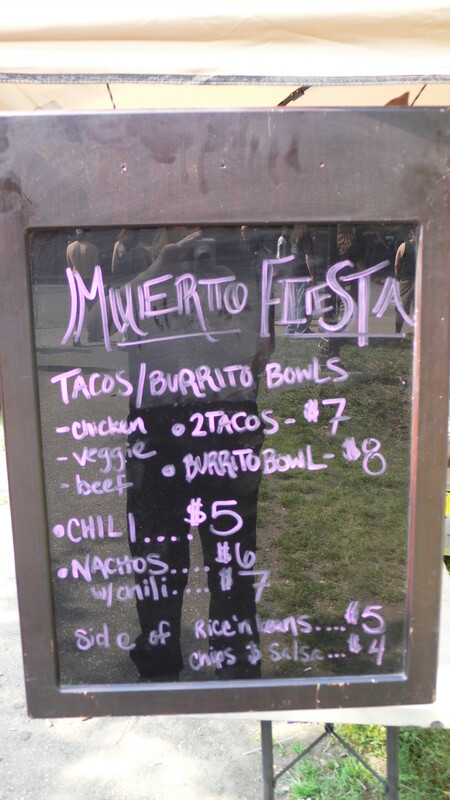 There will be a food vendor who sets up shop inside the fences, same one as last year. 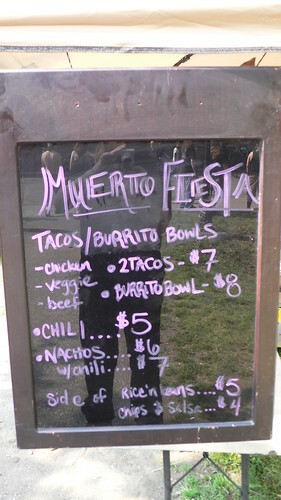 Apparently they will expand the menu to have at least three styles of food, as well as some vegetarian options. There is also some food available within walking distance of Sonar and you can check out the map I made (here) to figure out where that is. One cool thing about Deathfest is all the vendors there. There will be vendors where the indoor second side stage normally is at Sonar, as well as some outdoors in tents and booths. 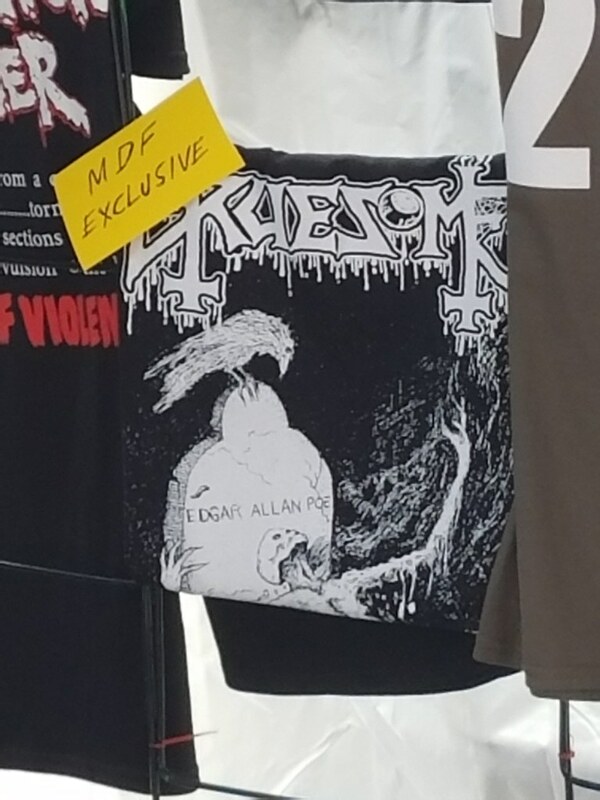 You can find all kinds of rare and obscure releases, bootlegs, merch and other stuff here and most of them will only accept cash. 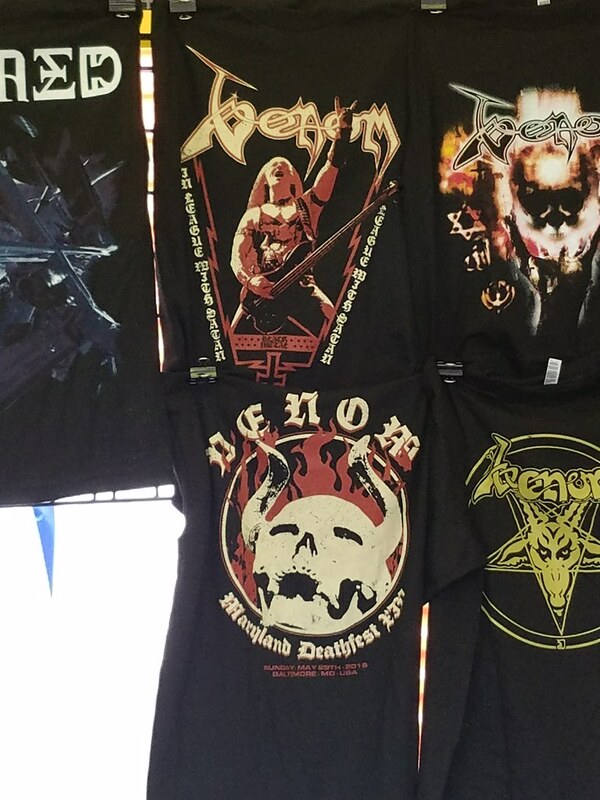 The list of vendors at this year’s fest is: Black Mess Productions, ChopoBrujos, Crucial Blast Records, Dave’s Metal (I couldn’t find a link), Deepsend Records, Deathgasm Records, Emetic Records, The End Records, Forever Plagued Records, Handshake Inc., Ibex Moon Records, IndieMerch, JSR Direct, Largactyl Records, Lock And Shock, Old Cemetery Records, Relapse Records, Season Of Mist, Sevared Records, Thrash Corner Records, Utterly Somber, Vienna Music Exchange, Warlord Clothing and Willowtip Records. 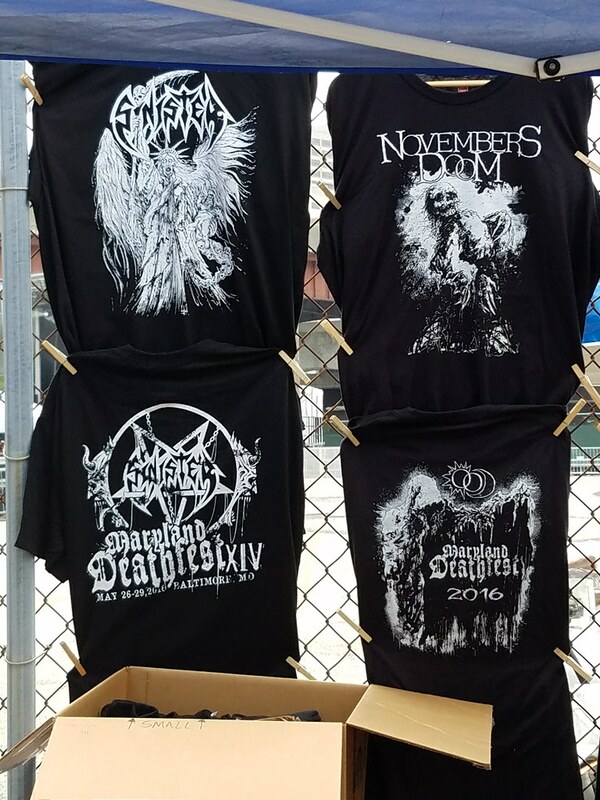 Last year they also had a corpse paint face painting booth (photo here) but I don’t know if that will be back this year or not. Relapse has even made a video commercial for their booth at this year’s fest and you can watch that below. If you get into town Wednesday and you’re looking for something to do that night, there will be a couple pre-fest metal shows going on. 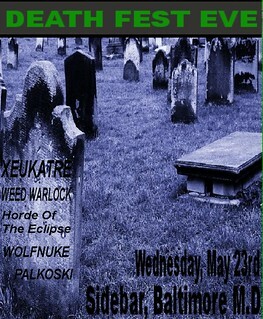 The Sidebar, a place that is walking distance from Sonar, will be hosting Xeukatre, Horde Of The Eclipse, Palkoski, Wolfnuke and Weed Warlock for just $8. The venue’s address is 218 E. Lexington St, Baltimore, MD 21202 (map) however the doors are actually just around the corner on Guilford Avenue. This show is ages 18+ only and the doors open at 8pm. You can see its Facebook event page here. 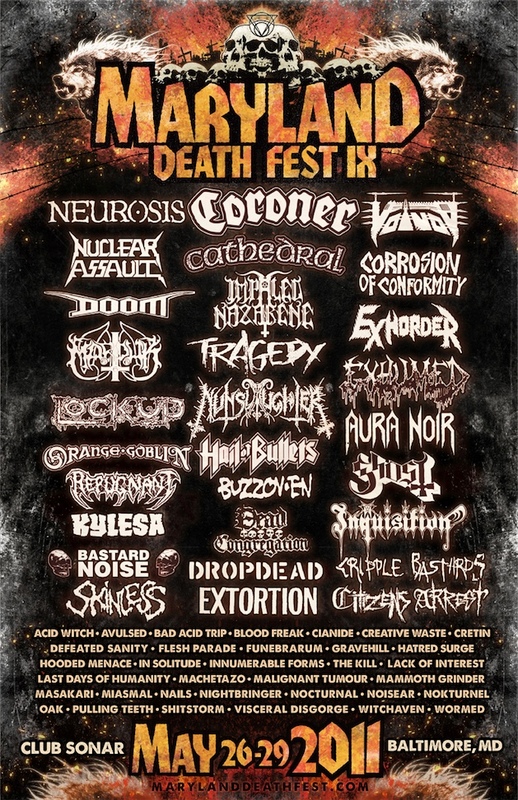 This show looks to be pretty awesome with a range of styles including black metal, stoner, grind and speed metal. 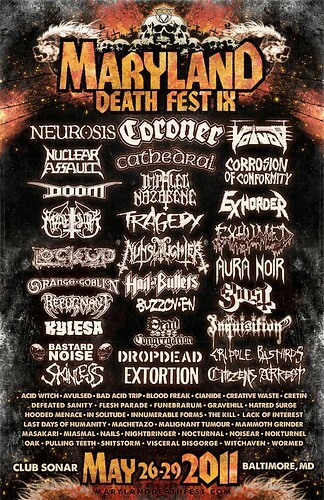 You can check out any of the bands by clicking their names. 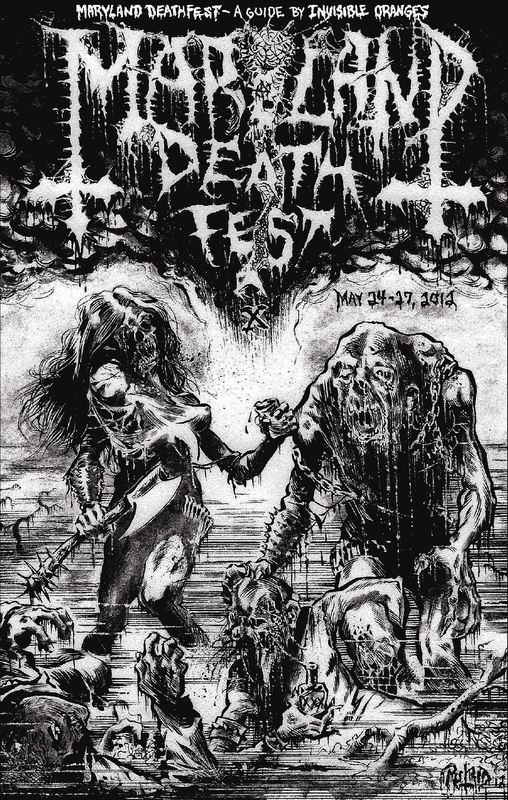 Also, for the four days the fest is going on the Sidebar will not be having bands play but will instead have DJs playing metal and punk music with tons of drink specials and no cover. 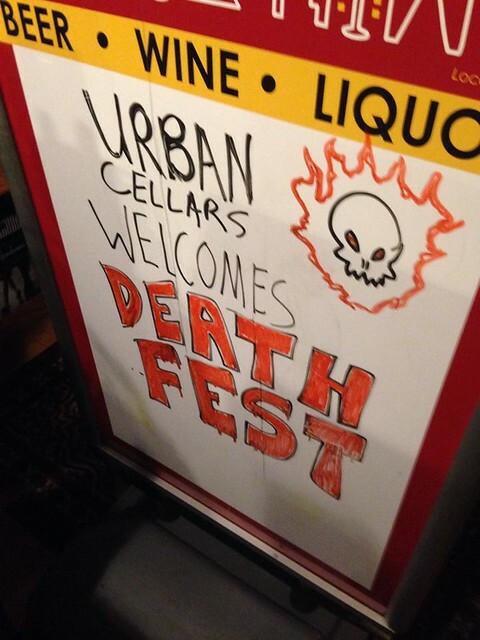 Sounds like a cheap place to knock a few back before heading in to the fest. Doors open Thursday and Friday at 8pm and Saturday and Sunday at 4pm. 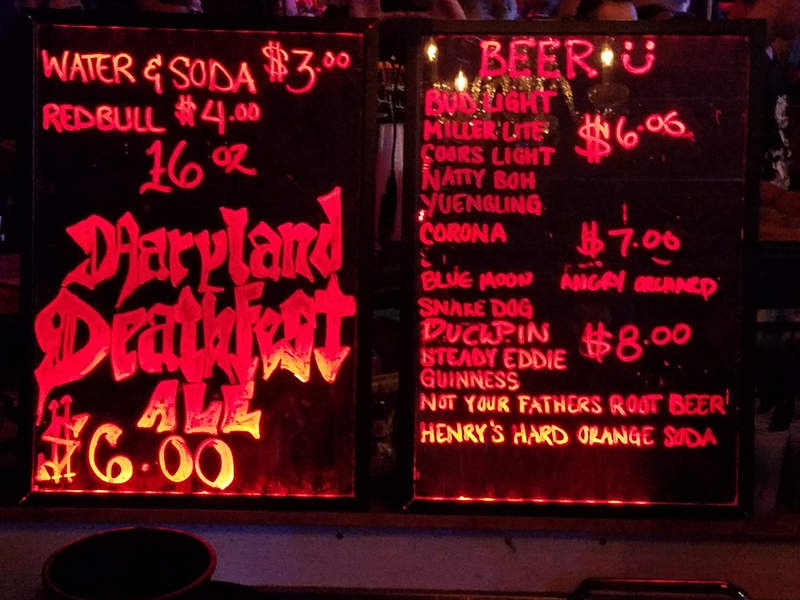 Another metal gig going on Wednesday the 23rd in Baltimore is at the Ottobar, located at 2549 N. Howard St, Baltimore, MD 21218 (map). 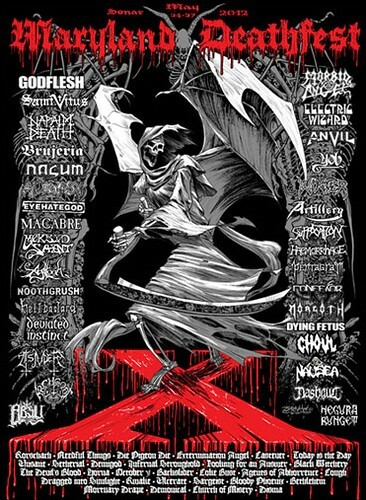 This show’s line up will be The Hackish, Visceral Disgorge, Seventh Chaos, Universal Remonster, SwampHög and Infidel, a group of bands definitely leaning toward the most brutal side of metal. 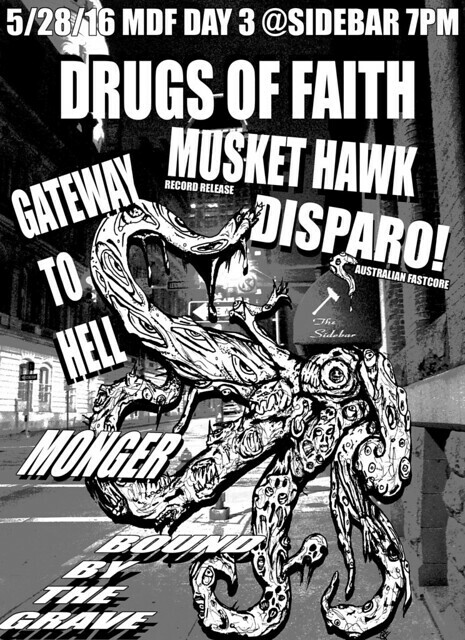 Death/grind band The Hackish has come up from Florida to play this show. It’s also $8 to get in and is open to all ages. Doors open at 7pm. It’s a bit farther away than the Sidebar show, however it is open to all ages. 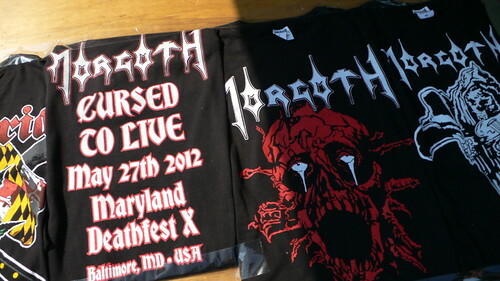 There are also two metal shows going on in Baltimore during Maryland Deathfest that are totally unrelated to the event. Power metal is a sub genre that doesn’t get much love at MDF and if you want to take a break and get some of that in then head over to the Baltimore SoundStage on Saturday the 26th for a spotlight on three power metal bands. Rhapsody Of Fire is coming from Italy to headline this show with their Australian touring support Voyager. 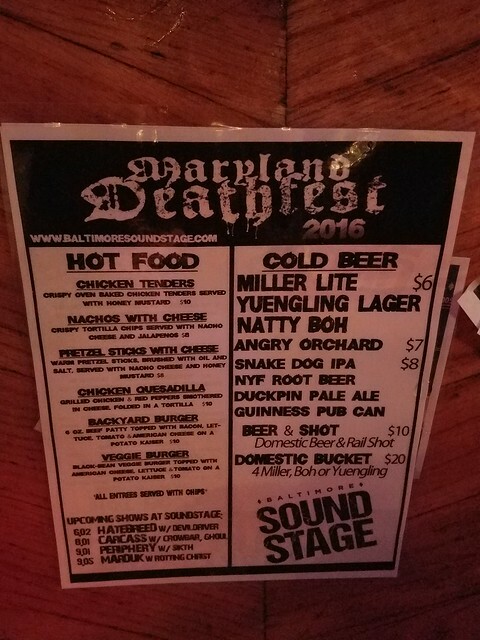 Washington DC natives A Sound Of Thunder will kick off this show which is located at 124 Market Pl, Baltimore, MD 21202 (map). It’s $29.50 to get in and this all ages show has doors open at 6pm and the first band start at 7pm. 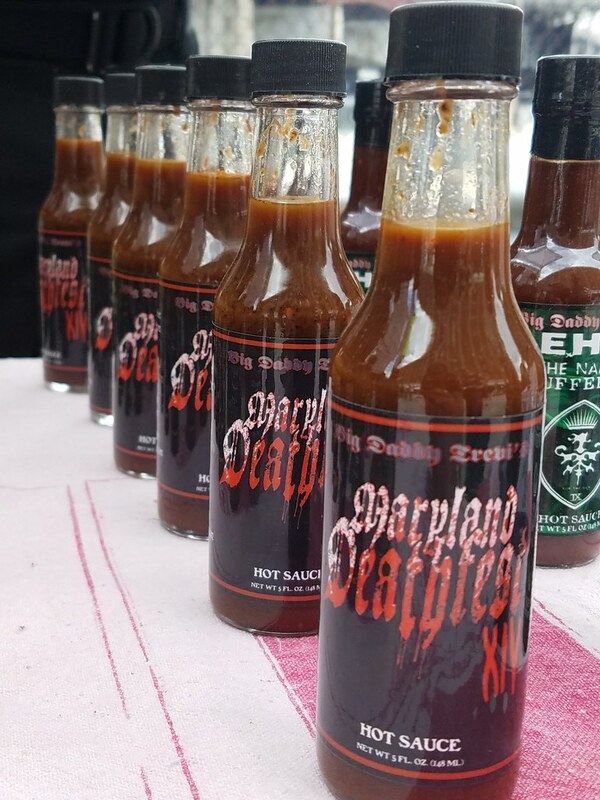 Just down the street from the Baltimore SoundStage and also on Saturday the 26th, Rams Head Live will be hosting a metalcore show of mostly local bands headlined by Sky Came Burning and Serial Attraction. 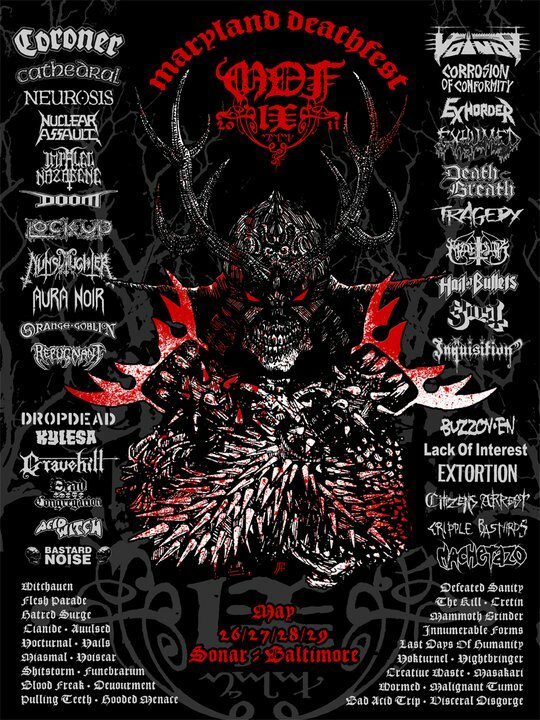 Also appearing will be The 10th Hour, Beyond Dishonor, GI9 and Blameshift. It will be $12 to get in. 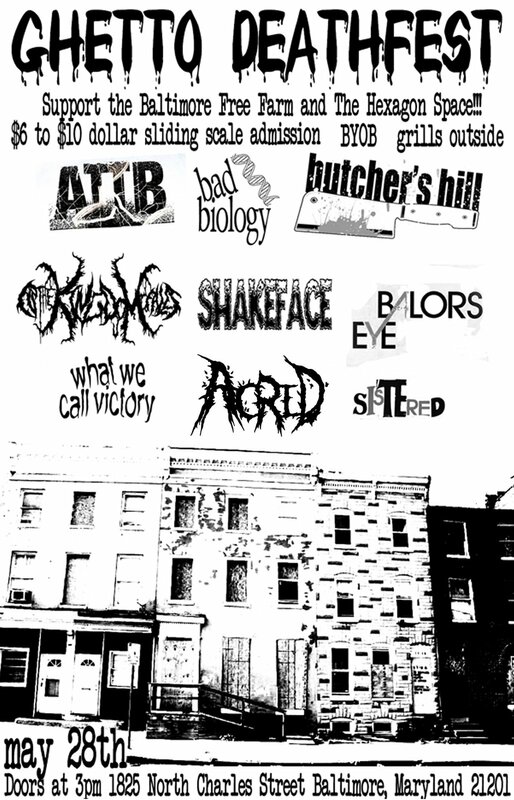 The venue’s address is 20 Market Pl, Baltimore, MD 21202 (map) and this show is open to all ages. Baltimore, MD 21211 (map). There is also The Sound Garden, a large record store that is pretty famous even outside of the city. Last year I saw Lee Dorian of Cathedral browsing the records there one afternoon. 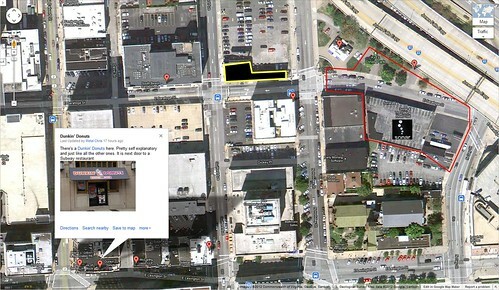 Their address is 1616 Thames St, Baltimore, MD 21231 (map). And if you want my recommendation of the best place to eat in town it’s Joe Squared. They are a gourmet pizza place with great beers on tap and even outdoor seating. It’s a bit pricey but where the hell else can you get things like avacado, lamb, corned beef, artichokes, or calamari on a pizza? Plus they’re open til 2am every night. Highly recommended! They have two locations, one near Rams Head Live and the Baltimore Soundstage at 30 Market Pl, Baltimore, MD 21202 (map) (I’ve never been to this location) and one at 133 W. North Ave, Baltimore, MD 21201 (map) which is a few blocks south of the Ottobar. 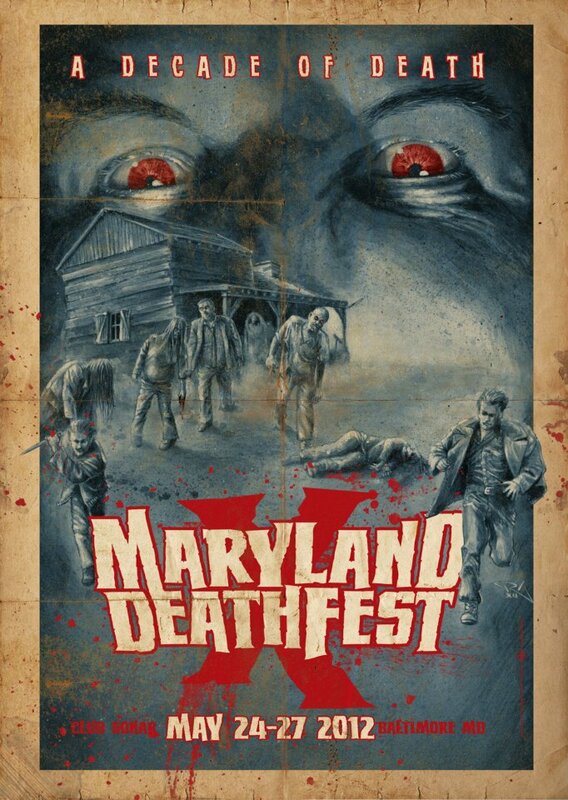 I’ll be at this year’s Maryland Deathfest for all four days and if you see me walking around be sure to say hi. 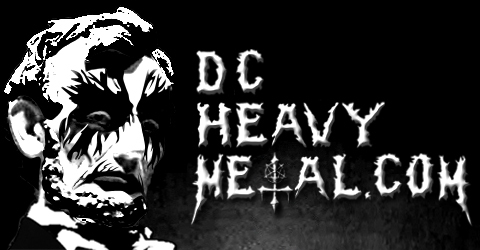 I’ll be handing out free DCHeavyMetal.com vinyl bumper stickers to anyone who wants one (and maybe some people who don’t). 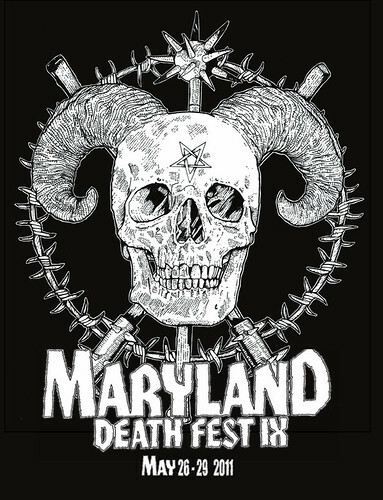 Recently I interviewed Evan Harting, one of the two organizers and co-creators of Maryland Deathfest and you can read or listen to that interview here. Shockwave Magazine recently conducted an interview with both of the guys who run Deathfest and you can check that out here. 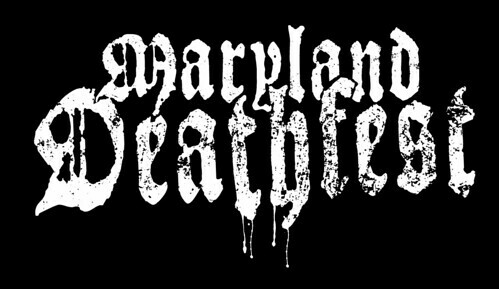 Baltimore blogger Mary Spiro has been counting down to Deathfest on her blog by listening to and posting short profiles of each band at this year’s fest and there are even some interviews in there with some of them too. Check out her MDF band profiles on her blog Metallomusikum here. NPR has posted a discussion about this year’s MDF with Bob Boilen, Lars Gotrich (NPR’s metal writer) and Kim Kelly (freelance metal writer) that you can listen to here. The Washington Post Express ran a preview piece, which I’m quoted in, that you can read here. Invisible Oranges made a short post about the fest, with a download of their guide, that is posted here. 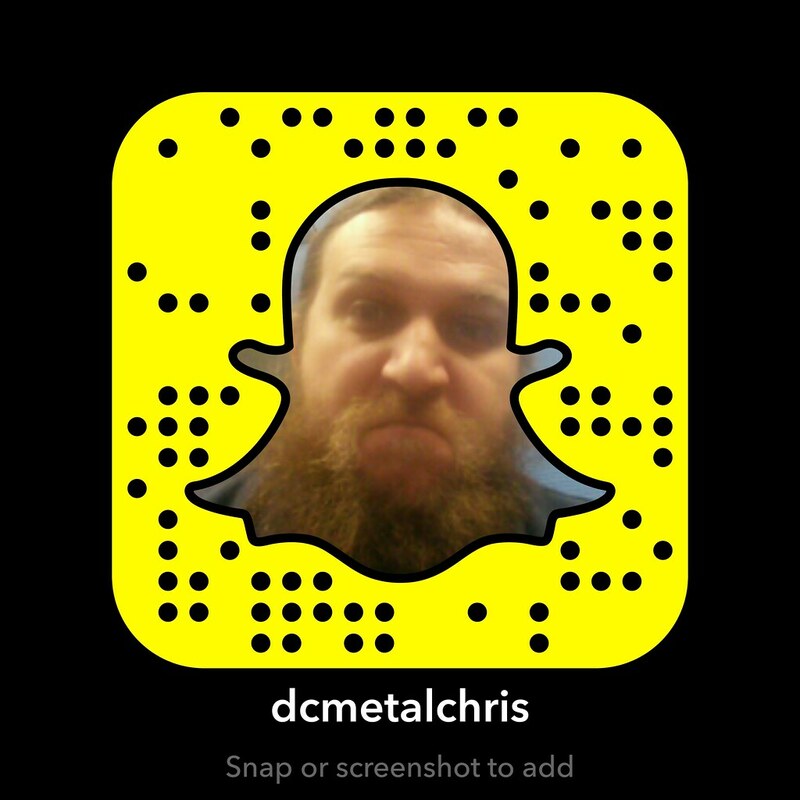 I hope this survival guide helps you enjoy the best four days of heavy metal in the area. I’m excited and I hope you all have fun whichever days you are going. Stay brutal everyone! 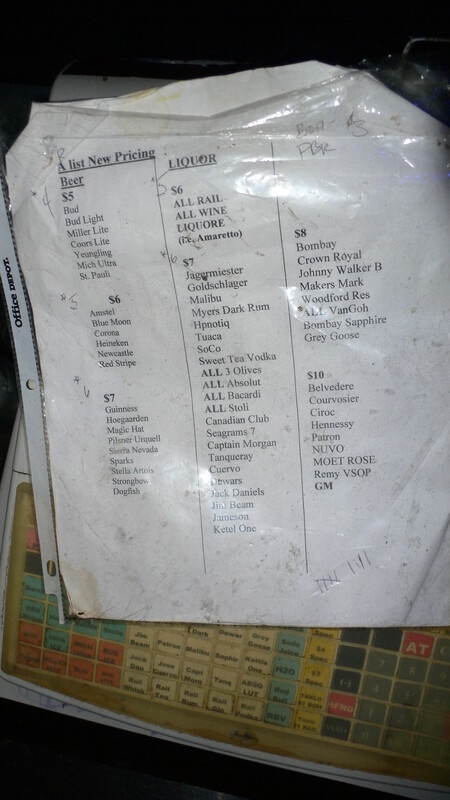 Here’s the alcohol price list for the bars inside the main room, you can click it to see it larger. 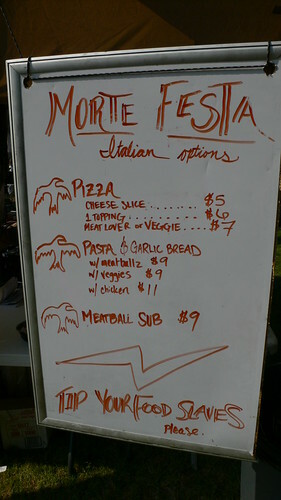 There are two food tents inside the MDF grounds this year. 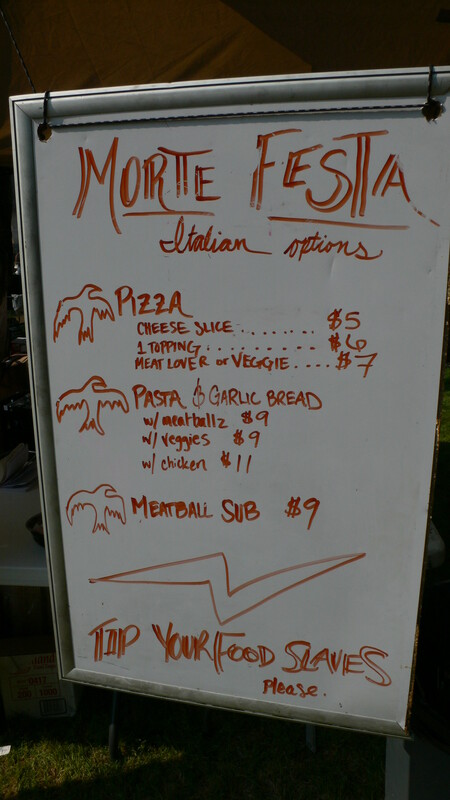 One has some pretty standard American food and the other has “Italian” and Latin food. 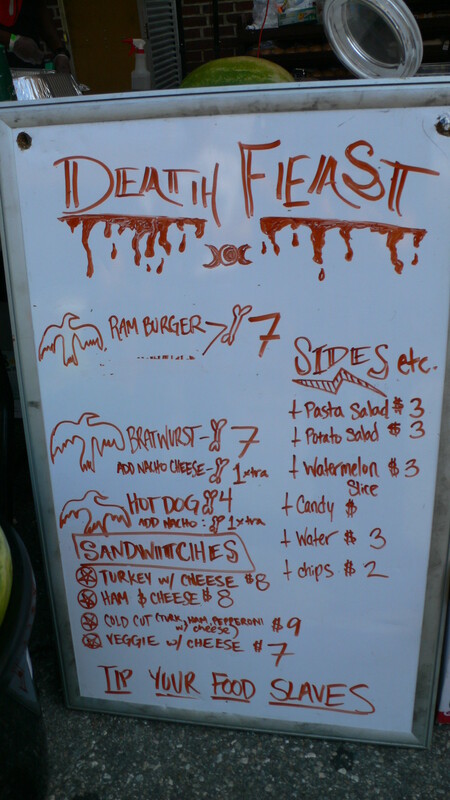 The three menus are all posted below, and you can click on them to see them larger if you want. 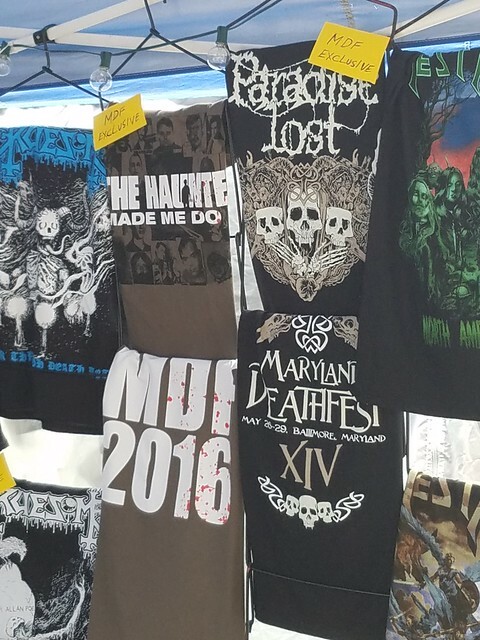 Also, there are some MDF exclusives but I’m trying to get back to the fest to catch one of my favorite bands, Macabre, play so I don’t have time to post the pictures yet. I’ll try to do that tonight. 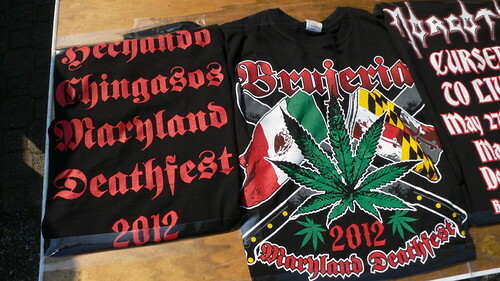 However, there is an exclusive Brujeria shirt, an exclusive Morgoth shirt (both shown below), and for some reason a vendor had exclusive shirts for a bunch of bands that aren’t even playing including: The Black Dahlia Murder, Aborted, Pig Destroyer, Brutal Truth, Misery Index, Cattle Decapitation, Rotting Christ and Devourment. There was also an exclusive Nasum shirt but that is now sold out. Oh, and Black Mess has a free to enter raffle to see Marduk, 1349, Wither and Weapon at Sonar on Saturday June 2nd. Winner gets a free pair of tickets to the show. You don’t have to buy anything to enter but check it out cause that show will be cool.